We were supposed to run a race Saturday, but Mo decided it was best not to die to get there. We had gone to celebrate Ma’s 80th birthday on Friday night, leaving up with a five-hour drive from 10 p.m. to 3 a.m. No problem, right? Ended up not being as much fun as the brochures would have indicated. We were driving along Highway 71 at midnight, dodging deer, when we pulled the plug and spent the night in a little town along the way. The next morning, we went to Austin. It was sad. I lived there for a while and it was always my favorite city. But these days it’s just really, really crowded. We drove through an endless series of traffic jams. 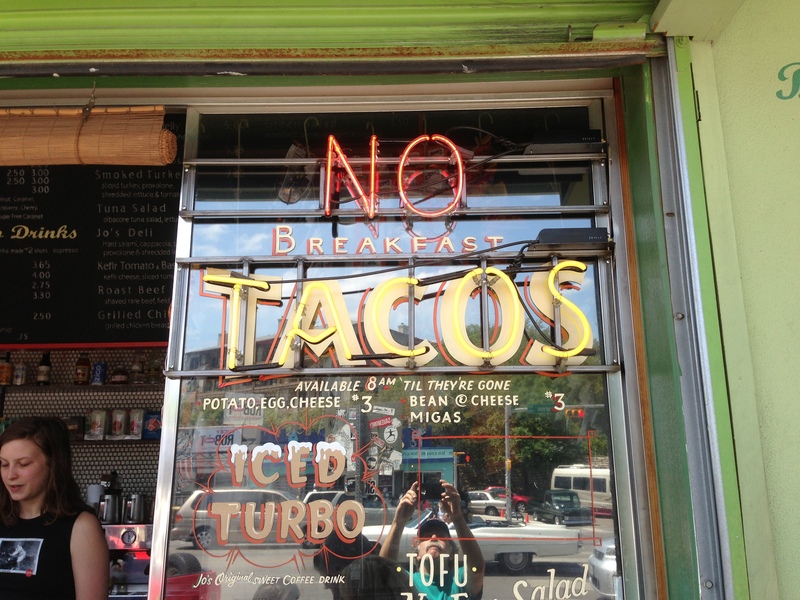 We were denied breakfast tacos. The Monkey Store had no Trail Monkeys. Run-Tex, the beloved ma-and-pa running store next to the trailhead, had just been evicted by the landlord. 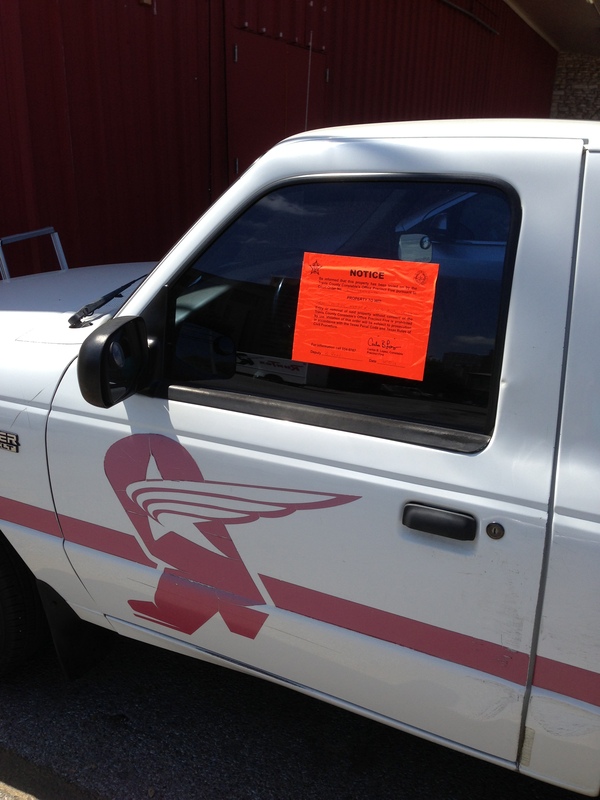 We stopped by to see the orange stickers all over the buildings and vehicles. On the bright side, Mo bought fabulous gifts for her sisters that she decided to keep for herself. Come to thing of it, we have a LOT of fabulous gifts for her sisters around here that she kept. I’m starting to think it’s just a ploy to buy stuff. Mo is sneaky. I think Austin is like the guy from high school you run into at the grocery store after 30 years. Better to remember it as it was back then rather than facing the stark reality that Austin now is mostly bald with a pot belly. While I remain virtually the same. A mystery indeed. The moral: You can’t go home again. And if you do, bring your own breakfast tacos. Image | This entry was posted in running and tagged life, oompa loompas, texas. Bookmark the permalink. That dude from high school must have really pissed off some 12 year olds. No breakfast tacos????? That does it… we need a new state capital. Wonder what city/town is the breakfast capital of Texas?? 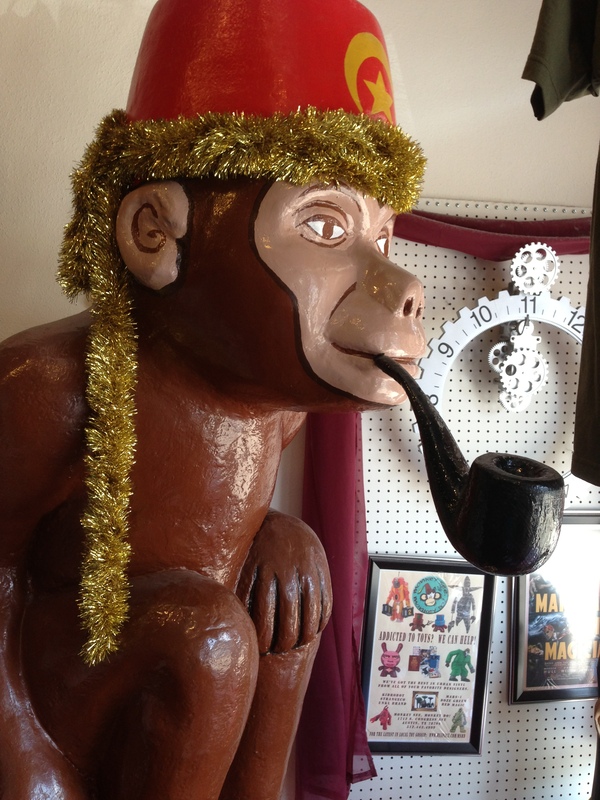 And there we have it… the perfect pic for the first sentence in my Spanish text: “Mi mono fuma una pipa.” My monkey smokes a pipe! But you can get iced turbo, so it wasn’t a complete loss. I was in school in Austin in the early 1950’s and wished I could live there forever. Damp cool mornings, huge oak tree lined streets with hanging moss, lots of birds and three streets to get you anywhere, the drag, Lamar, and Congress Ave. There was a ‘Somewhere’ hamburger place very few blocks. I am scared to drive through there anymore. Glad I don’t live there~I love your running stories!